Bakery to Google: Take 's--t' out of our logo! Greggs, the largest bakery chain in the United Kingdom, woke up to an unfortunate Google problem Tuesday. If you Googled "Greggs" Tuesday morning, you would have found an altered logo that included a profanity. Rather than ignore it or handle the mishap behind the scenes -- as most companies would -- Greggs took to social media to poke fun at the situation. "Hey @GoogleUK, fix it and they're yours!!!" tweeted @GreggstheBakers, showing a tray of a dozen donuts (or "doughnuts," in this case, since Greggs is based in England). 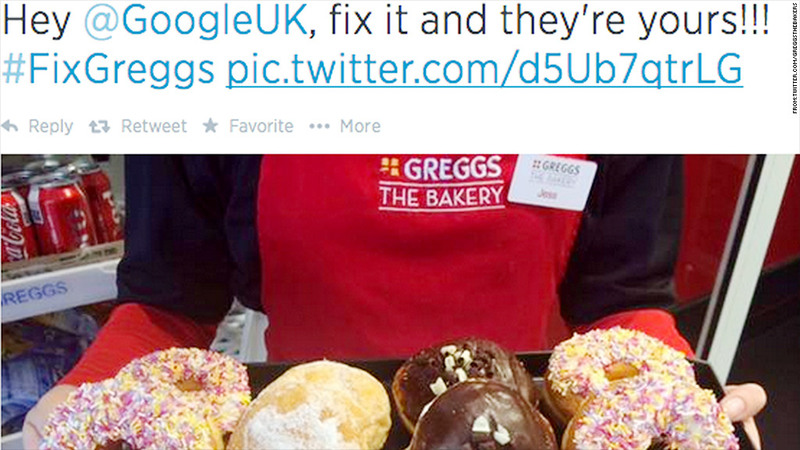 Google responded: "Sorry @GreggstheBakers, we're on it. Throw in a sausage roll and we'll get it done ASAP." The profane logo was taken down at around 10:30 a.m. ET, after which Greggs tweeted: ". @GoogleUK WE LOVE YOU GOOGLE!!!!" Spokesmen from Google (GOOG) and Greggs did not immediately respond to requests for comment. Google pulls images for businesses and celebrities from third-party websites. Gregg's Wikipedia page has been changed a whopping 25 times Tuesday, though the image appears to have come from Wikipedia parody site Uncyclopedia.